Some of the greatest stories of American literature are the stories of the authors themselves and the places that sparked their imaginations. This award-winning 304 page coffee table book takes a look at 26 of America’s great authors and the places that inspired them. Unique to this book of literary biography is the element of the photograph. With over 140 photographs throughout, the images add mood and dimension to the writing – and they are often shockingly close to what the featured authors described in their own words. Lushly illustrated, and beautifully designed, the book is as much of a pleasure to look at as it is to read. It’s the perfect gift for book lovers. It is a beautiful and necessary book. This absolutely gorgeous book belongs in every book lover’s library. What a very beautiful and evocative book! I am pleased — and honored — to be a part of it. A wondrous tour ideal for enriching any literary collection – and sure to appeal to armchair travelers as well, A Journey Through Literary America lives up to its title and is highly recommended. It is indeed a gorgeous book. Neither the text nor photos dominate, but work well in harmony to create a book that can be browsed for its images or curled up with and delved into for its writing. This award-winning 304-page coffee table book takes a look at 26 of America’s great authors and the places that inspired them. Unique to this book of literary biography is the element of the photograph. With over 140 photographs throughout, the images add mood and dimension to the writing – and they are often shockingly close to what the featured authors described in their own words. Lushly illustrated, and beautifully designed, the book is as much of a pleasure to look at as it is to read. “What do you see when you get there?” asked Edwards. Walden Pond. In the 1700’s, Walden Woods was a hideout for fugitives. By the 1820’s, the once-forbidding woods and pond had become a place of profound inspiration. The 610 acre Willa Cather Memorial Prairie preserves an example of the native grassland that once covered Nebraska. 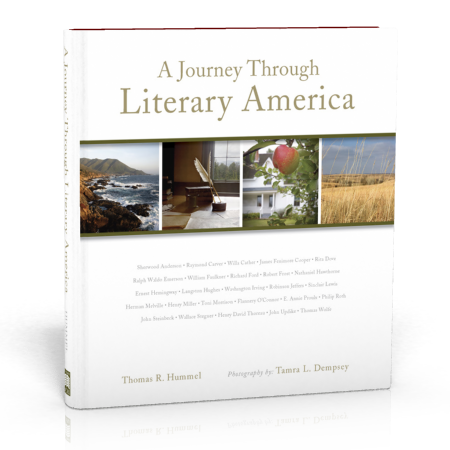 View addresses and reading recommendations for the authors and locales within A Journey Through Literary America. 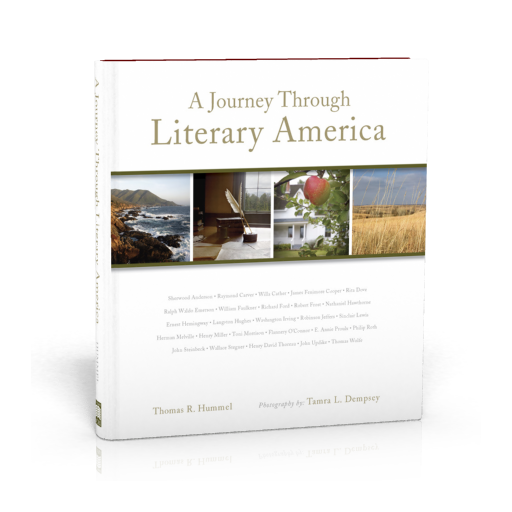 We encourage you to use the book and this website to launch your own journey into literary America.